HP is actively promoting Windows 7 over the newer, more controversial Windows 8, even going so far as giving customers discounts for buying PCs with the older OS. 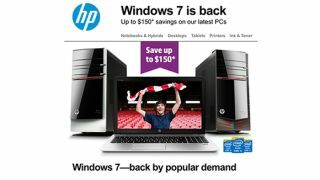 The PC maker has been emailing customers advertising the discount, saying that Windows 7 is "back by popular demand." Specifically, it's Windows 7 PCs for $150 (£91, AU$170) less than its Windows 8 machines. In addition HP's retail website currently features Windows 7 PCs much more prominently than Windows 8 PCs, in the laptop section and especially in desktops, where it's not displaying any Windows 8 machines at all. It's unclear why HP is emphasizing Windows 7 over Windows 8 so adamantly. But it may be right about the "popular demand" thing; Windows 8 launched to severe criticism from all sectors of the tech industry, from consumers to reviewers to developers. Even Microsoft's own employees have admitted that Windows 8 is "the new Vista," referring to the oft-maligned Windows 7 predecessor Windows Vista. And a Samsung executive said much the same thing early in 2013. While in TechRadar's definitive Windows 7 review we called it "the best Windows operating system ever." Windows 9 is launching in 2015, and many Windows users are hoping for some drastic changes to Microsoft's OS. As recently as a month ago Windows 7 was still growing faster than Windows 8 in computing markets.